Description: This study argues that the book of Hosea ought to be understood and read as a text that was composed in Persian-period Yehud rather than in eight-century Israel. The author challenges the traditional scholarship and emphasizes that there is the evidence to suggest that the book should be viewed as a Judahite text - a book that was composed in the late sixth or early fifth century B.C.E. Bos provides an overview of the state of prophetic research, as well as a discussion of genre and the generation of prophetic books, linguistic dating and provenance; and a survey of Hosea research. 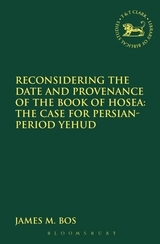 Bos discusses various aspects of the book of Hosea that aim to prove his argument the book was composed in Persian-period Yehud - the anti-monarchical ideology of the book, the dual theme of �Exile' and �Return' which is consistent with the discourse found in other Judahite books dating to the sixth century; and the historiographical traditions. Citation: Pamela J. Scalise, review of James M. Bos, Reconsidering the Date and Provenance of the Book of Hosea: The Case for Persian-Period Yehud, Review of Biblical Literature [http://www.bookreviews.org] (2014).